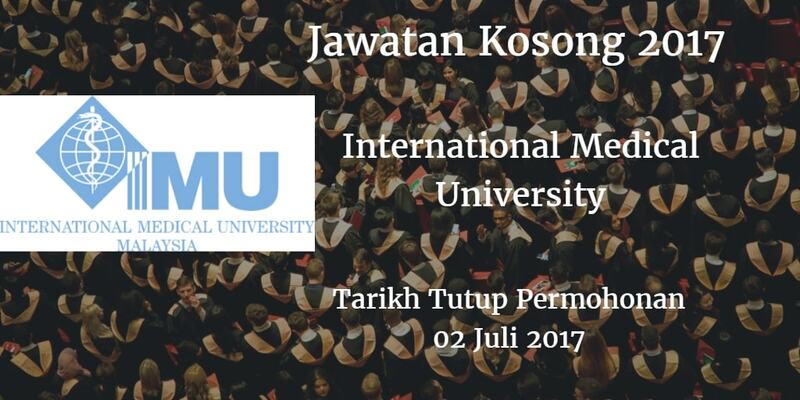 International Medical University (IMU) terkini terbuka sepanjang tahun 2017. Sukacita dimaklumkan bahawa terdapat pelbagai kekosongan jawatan International Medical University (IMU) akademik dan bukan akademik berikut. Peluang kerjaya di International Medical University (IMU) . International Medical University (IMU) would like to invite qualified candidate to fill in below vacant position vacancy. To review and analyse the university processes and procedures. Priorities include process improvement, improving efficiency, and analysis for all areas of servicing with the objective of optimizing expenses and opportunity cost. This role also covers project management activities in which the candidates will need to drive successful implementation of projects. Bachelor Degree in any field with minimum 5 years’ experience in process analysis and 2 years' experience with management responsibilities. To support the department in various functions in Corporate Secretarial. Legal, Risk Management, Internal Audit and Corporate Governance. The main tasks include preparation for Management Committee meetings, Audit Committee & Board meetings, drafting tenancy agreements and preparing quarterly Internal Audit reports for the Group. ICSA graduate or Degree holder in any discipline with minimum 3 years of relevant working experience. Proficient in English language and Bahasa Malaysia. both written and spoken. Sound knowledge of the Companies Act and familiar with the Bursa Malaysia Listing Requirements and other relevant regulations. To take charge of the annual performance management exercise which includes objective setting and mid/year end performance reviews. This role also assists in developing, implementing and evaluating talent management and succession planning exercise as well as the development interventions to meet the IMU Development the Objective. Bachelor’s Degree, Post Graduate Diploma, Professional Degree in any field with minimum 3 years of relevant working experience. Hands-on experience in training and development methodologies, training needs analysis and performance management. staff benefits, payroll & claims as well as the annual bonus, increment and promotion exercise with the necessary study and benchmark against the market industry. This role is also the HRIS owner for all C&B related modules. Preferably a Master’s degree in a related field or a Bachelor degree in related field with minimum 10 years of C&B experience of which 3 years in managerial capacity. Well versed and hands-on in C&B operations with the ability to strategi, formulate and articulate sound HR policies. Please visit us at www.imu.edu.my/about-iob.html forfurther details on the available job vacancies. Interested candidates are welcomed to apply via e-mail to recruitment@imu.edu.my along with their complete CV as attachment, e-mail address, contact number and names & contact details of three referees. Kindly indicate this reference number: Ref. No: CSJAo062017 in the cover letter subject column.